First off, Cabbage Patch Kids. I remember a Polaroid photo I took of all my CBK's lined up on my bed. I also can envision a photo of myself, possibly around age 6 or 7 with my first CBK that I had gotten for my birthday. I was so elated. 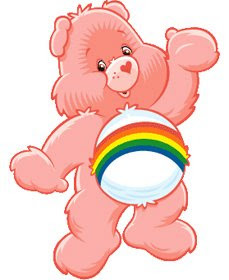 Next were Care Bears- I also had a large assortment of those, Cheer Bear being my favorite. Strawberry Shortcake was a favorite- I had everything from books to those sweet smelling dolls. I have great memories of playing with my brother and somehow incorporating my Strawberry Shortcake figurines with his GI Joes in some sort of intermingling of gender specific plastic doll playtime. Although the Smurfs was a cartoon, I had a lot of the related novelties that came with their popularity. My favorite was a baby Smurf doll that spoke. I remember that it was so cute and super cuddly. Now the irony of all these toys is that they have renewed popularity. These are toys from cough.. cough *20 years* ago cough... cough that are now cool again. And, of course, I jumped right on the band wagon and bought all of them for my girls as soon as they showed the slightest interest. Hey, what good are kids if you can't relive your youth through them??? Although, as Christine pointed out, the Care Bear videos (circa 1986) are no where near as cool as they were when I was 10. However, my 3 year old doesn't seem to mind- she seems oblivious to the insane animation and technology that she has available to her now with modern tv and movies. She also loves her Care Bears and Cabbage Patch Dolls regardless of their lack of power supply, memory chip or USB connectivity. What toys do you remember from childhood? Have they come back around for your children? Do they still make you happy? My little pony, She-ra, Malibu Barbie. Listened to Debbie Gibson. Material Girl, Nancy Drew Books, Beverly Clearly books, Koolaid, Star Wars, yup the 80s! I had all the same toys, but my all time favorite was my Annie Mansion, and dolls. I loved it. It was a big doll house just like Daddy Warbucks Mansion, and I had all the charactors. You are young enough to be my daughter, so I remember all those toys that you mention---getting them for my girls! Loved the little ponies, and Strawberry Shortcake dolls!! Barbie, Barbie and more Barbie. My brother had Planet of the Apes dolls...so I would have Barbie dating a really buffed out Ape. Not unlike many of the men that I dated. Self-fullfilling prophecy? my all time favorite was lite-brite. with the black sheet of paper & poke the little lights through ... such a very cool thing ... hmmm .. wonder if that is around? .... oh & my pogo-ball too. oh ... thanks ... that was fun! ywp, care bears, rainbow brite, my little ponies, she ra, Malibu Barbie. I still try to look like Malibu Barbie. You can usually find me in the corner, dripping with self tanner, pink frosted lipgloss, and blue eyemakeup.